Playwrights are like men who have been dining for a month in an Indian restaurant. I went to Centra Majorstuen, my favourite supermarket yesterday. It was obvious that white asparagus were in season, as you could choose from fresh white Belgian sprouts in abundance for only NOK 19 per kilo (2,50 EUR). I went in, as the original offer was NOK 99, i.e. 16 EUR, but discovered to my joy that the price had reached this ridiculously low level, because they had been supplied with too much. Norwegians may have discovered the joy of fresh asparagus just the last decade, but the delicious white variety is unknown to many. 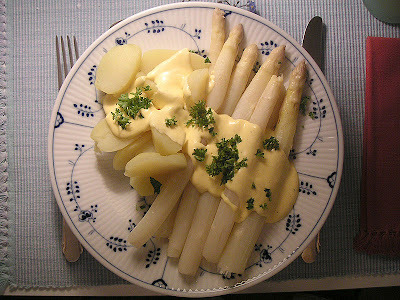 I have indulged in white asparagus in Germany, lightly cooked in salted water, then served with Hollandaise sauce and cured ham. To prepare them is easy. Cut off the lower part of the stalk, as this tends to be rather tough. Peel the asparagus 2/3 up. Bring lightly water in a steel casserole up to boiling point(this as aluminum casseroles will leave an unpleasant mineral taste on the asparagus). Leave the asparagus to boil for 8-10 minutes. Do not cool down in cold water, as this will make them watery and unpleasant. Serve piping hot with butter or a tasty sauce, as main dish, or as a starter. PS: I have bought two kilos for me to indulge during my spring break!